The Adafruit Neopixel library is Esplora compatible, having confirmed this last night. I used a 4x4 matrix and ran it all with an external 5V supply. An external supply isn't absolutely necessary. 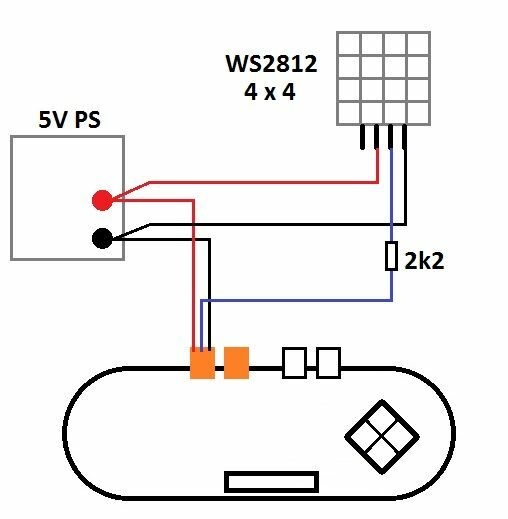 If you have a few neopixels or similar, it's OK to use V_usb, but if you get a 4x4 or something and try and make them all 'white' then that much may over-burden "Mr. USB"
> > > Adding wiring diagram. NB - All matrixes may not have the same pin-out as mine. The resistor is NOT optional. I used a 0.1uF decoupling cap (not shown) at the matrix power pins; good practice but maybe not essential. If you have a strip or a string then an external supply is required. WS2801 require two pins, so you need both "tinkerkit" pins. (...or use those jumper wires you all like so much).